Dr. Carissa Pokorny-Golden has been named Interim Associate Dean of the College of Education for Spring 2017. 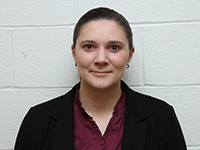 Dr. Pokorny-Golden works closely with the Kutztown University Secondary Education Program, and will begin this role on January 3, 2017. According to Dean Teitelbaum, Pokorny-Golden will primarily assist the College of Education in accreditation/assessment, student retention and recruitment, and curriculum and program development processing.